Prof. Morandotti’s group demonstrates a technique for generating a stable coherent train of ultra-short laser pulses. Most mode-locking techniques introduced in the past focused mainly on increasing the spectral bandwidth to achieve ultrashort, sub-picosecond-long coherent light pulses. By contrast, less importance seemed to be given to mode-locked lasers generating Fourier-transform-limited nanosecond pulses, which feature the narrow spectral bandwidths required for applications in spectroscopy, the efficient excitation of molecules, sensing and quantum optics. Nonlinear amplifying loop mirror (NALM) stage (right) and amplifier stage (left) constituting the nanosecond mode-locked laser. The NALM stage consists of the microring resonator (free spectral range 200 GHz, Q factor 1.3 × 106), a filter (200 GHz at 1,556 nm, determining the ring resonance of operation) and a semiconductor optical amplifier (SOA). 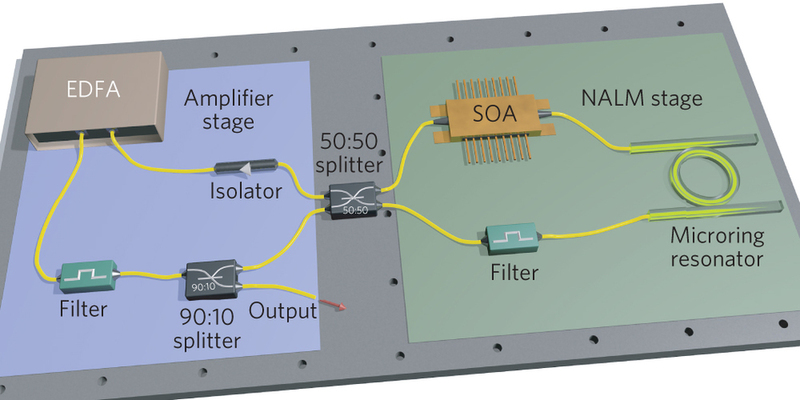 A 50:50 beam splitter connects the NALM stage to the amplification stage. This section contains an optical isolator (determining the direction of pulse propagation), an erbium-doped fibre amplifier (EDFA), a second filter (200 GHz at 1,556 nm), as well as a 90:10 beam splitter for coupling 10% of the power at the output. All elements are optically connected by polarization-maintaining fibres, ensuring an environmentally stable operation. Here, we demonstrate a passively mode-locked laser system that relies on simultaneous nested cavity filtering and cavity-enhanced nonlinear interactions within an integrated microring resonator. This allows us to produce optical pulses in the nanosecond regime (4.3 ns in duration), with an overall spectral bandwidth of 104.9 MHz—more than two orders of magnitude smaller than previous realizations. The very narrow bandwidth of our laser makes it possible to fully characterize its spectral properties in the radiofrequency domain using widely available GHz-bandwidth optoelectronic components. In turn, this characterization reveals the strong coherence of the generated pulse train.